I’ve spent the last three weeks listing and discussing the best major league everyday players since 1900 using a special version of Bill James’ Win Shares called Win Shares Above Bench. Today, I’m going to talk about the best pitchers since 1900. I won’t go into the math yet—there will be tons of gory detail at the end—but WSAB takes a lot of things into account (ERA, wins, fielding support) to evaluate a pitcher and also applies a baseline that provides appropriate context (call it Loss Shares, playing time or what have you). It may not be perfect, but it’s pretty darn good. In the history of baseball, pitching has changed more than batting has. If we were to include the 1800s in our survey, the top of the list would be filled with the likes of Kid Nichols, Tim Keefe, John Clarkson and Hoss Radbourn; pitchers who pitched half of their team’s games, were never relieved and sometimes pitched from only 45 feet away. These men were obviously great pitchers and deserve their due, but what they did was very, very different from what pitchers did in 1906, 1956 or 2006. Then again, change didn’t occur overnight. The regular four-man starting rotation didn’t really take hold until the 1920s/1930s (now we have the five-man rotation), and at the start of the 1950s starting pitchers still completed 40% of their starts (vs. 3% today). So when you compare pitchers across eras, you’re chasing an elusive standard. But hey, let’s remember our motto: This is Fun! As before, I will rely heavily upon Fangraphs and Baseball Reference for little factoids about each player. I’ll also be referring to some basic pitching stats, such as strikeouts, walks, ERA and something called Batting Average on Ball in Play (the proportion of batted balls that fall in for hits, not including home runs). 1. Walter Johnson (387 WSAB/560 WS): In this year’s Hardball Times Annual, David Gassko ranked the all-time best pitchers using something called Pitching Wins Above Replacement. David’s system is similar to Win Shares Above Bench, but it differs in one significant way: it adjusts for the increasing level of competition over time. It gives current pitchers credit for succeeding in a tougher environment (better training, medical support and a larger pool of talent to draw upon). As far as I know, that is the only legitimate way you can develop a system that doesn’t place the Big Train first among the post-1900 pitchers (Johnson is second in PWAR). Pitching from 1907 through 1927, he was among the top three league leaders in strikeouts fifteen times, ERA twelve times and shutouts eleven times. He placed in the top 10 youngest players twice at the beginning of his career, and the top 10 oldest players four times at the end of his career. I won’t bother quoting all the superlatives associated with the man; he was simply awesome, dude. 2. Grover Cleveland Alexander (325 WSAB/476 WS): Pete Alexander was a contemporary of Johnson’s. He didn’t dominate the National League as completely as Johnson dominated the American, but he came close. 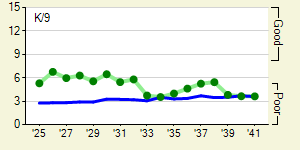 The graph shows how Alexander’s ERA compared to the league average each year. Every pitcher at the top of this list has a similar graph. These guys were consistently, exceptionally good. 3. Roger Clemens (292 WSAB/435 WS): Clemens has no chance of catching Johnson, and little chance of catching Alexander. But as I said upfront, it’s much harder these days to accrue a lot of pitching Win Shares. And if you believe baseball is more competitive now than it used to be, you pretty much have to agree with David Gassko that Roger Clemens is the greatest pitcher of all time. Clemens has covered every angle: he has posted a 3.11 ERA at home and 3.09 on the road. Righties have hit .227 against him, lefties have hit .229. His career ERA is 2.92 during the day and 3.20 at night. No matter where he’s pitched, who he’s faced or what situation he’s pitched in, Clemens has dominated. 4. Christy Mathewson (286 WSAB/426 WS): Mathewson was a great man and a great pitcher. He was one of the few people (only person?) willing to speak out about the Black Sox scandal at the time it occurred, and he is the subject of Eric Rolfe Greenberg’s wonderful book, The Celebrant. Mathewson led the league in ERA five times and had the lowest walk rate seven times. 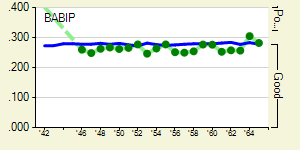 As the graph shows, his walk rate dropped substantially as he aged. Unfortunately, his strikeout rate eventually dropped too, causing him to hang up his spikes in 1916. 5. Lefty Grove (275 WSAB/391 WS): Grove pitched in the 1920s and 1930s, one decade more current than Johnson, Alexander and Mathewson. He led the American League in strikeouts seven straight years, but a sore arm (coinciding with a trade to the Red Sox) made him a different kind of pitcher the second half of his career. Still, he led the league in ERA four times after being traded to the Sox. 6. Warren Spahn (257 WSAB/412 WS): On the other hand, Spahn is 43rd in All Star Win Shares. That’s not shabby, but he built his tremendous credentials (and his Hall of Fame plaque) by being consistently very, very good for 21 years. Spahn led the league in ERA “only” three times, but in three different decades. You know how some people say that pitchers can’t control what happens to balls that are hit against them (batting average on balls in play)? Well, there are several pitchers on this list who belie that notion, and Spahn is one of them. 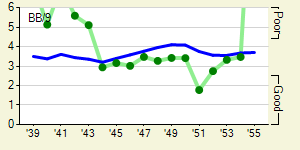 In the graph, you can see that Spahn consistently had a lower BABIP than average. The difference may not look like much, but that’s only because of the graph dimensions. His career BABIP was .265, when the major league average was .278. And he did it year after year, with different sets of fielders behind him. 7. Tom Seaver (247 WSAB/388 WS): Most pitchers lose their ability to strike out batters at some point in their careers. For some, like Johnson, it’s gradual. For others, like Grove, it happens quickly. For Seaver, one of the greatest strikeout pitchers of all time, it pretty much happened in 1979, his second full year with the Reds. Most of the pitchers at the top of this list figured out how to pitch well after they lost their strikeout edge. Seaver is a good example. In 1981, when Seaver was 14-2 with a 2.54 ERA, his BABIP was only .224. 8. Greg Maddux (244 WSAB/380 WS): Maddux is the first person on this list who never led his league in strikeouts. But he had the best walk rate in the league seven times, didn’t allow home runs and also had a consistently low BABIP (see the graph). No doubt, his BABIP was helped by his fine glovework (16 Gold Gloves and counting) but there’s a reason Rob Neyer calls him the Smartest Pitcher Who Ever Lived. Maddux is one of the most unique pitchers of all the greats. 9. Eddie Plank (230 WSAB/361 WS): Eddie Plank takes us back to the Mathewson era—he was the A’s great lefthander before Grove. Like Grove, he didn’t reach the majors until the age of 25, but he pitched into his 40s; sort of an early version of Warren Spahn. Plank is easy to overlook—he was overshadowed by Johnson and never led the American League in ERA, strikeouts or walk rate—yet he still manages to rank ninth in WSAB. Plank was born in Gettysburg, PA, went to Gettysburg College, and led tours of the Gettysburg battlefield after he retired and died in Gettysburg. 10. Phil Niekro (214 WSAB/374 WS): Maddux may have been unique and Spahn may have had a long career, but Niekro beats them on both counts. He’s another guy who didn’t make the majors until he was 25, but that’s okay. He pitched until he was 48. As you might imagine, Niekro’s credentials are all about career length, the benefit of mastering the mighty knuckleball. Niekro is tenth in WSAB but 67th in All Star Win Shares. His favorite park must have been Candlestick, where the gusty winds could add a little twist to his knuckleball. In fact, his career ERA at Candlestick was 2.37 (in 235 innings). 11. Steve Carlton (213 WSAB/366 WS): Most everyone knows about Carlton’s career year in 1972 (at the age of 27), but he was also a terrific pitcher into his late 30s. 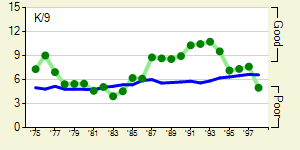 Take a look at how he maintained his strikeout rate through until 1985, when he turned 40. 12. Garylord Perry (212 WSAB/369 WS): Perry’s Hall of Fame case is similar to Niekro’s: a long, long career and a funky pitch. He was one of the top five oldest players in his league for seven straight years. 13. Mordecai Brown (203 WSAB/296 WS): “Three Finger” Brown vs. Christy Mathewson may have been the greatest pitching rivalry in baseball history. The two faced each other 25 times, often with a pennant at stake, and Brown won 13 times, lost 11 and had one no decision. The rivalry reached its peak in that June 13, 1905 game, when Brown one-hit the Giants but lost to Mathewson, who no-hit the Cubs. Brown was the Greg Maddux of his day. He didn’t strike out many batters, but he also didn’t walk many and benefited from perhaps the greatest fielding team of the 20th century, the Cubs of 1904-1910. 14. Bob Gibson (203 WSAB/317 WS): Gibson’s 1968 is certainly one of the greatest pitching seasons of all time. His 1.12 ERA (boggles the mind, doesn’t it?) set a modern day record and his amazing performance in the World Series (even though the Cardinals lost to the Tigers) cemented his reputation. So how did he do it? What made 1968 stand out from all the other years? It was a convergence of everything, really. His strikeout rate wasn’t any higher than usual, but he had career bests in walk rate, home run rate and BABIP. 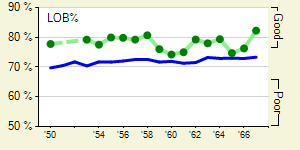 And most importantly, he left 87% of the men who reached base against him on base, as the lefthand graph shows. How did that happen? Well, batters only batted only .141 vs. Gibson with runners in scoring position, more than forty points lower than his overall BA allowed of .184. Gibson had a big career platoon differential, by the way. Lefties hit .257 against him; righties hit .204. 15. Robin Roberts (201 WSAB/339 WS): In the new Baseball Historical Abstract, Bill James described the “Robin Roberts” family of pitching (which includes Fergie Jenkins and Catfish Hunter) thusly: they would all go 23-14, 22-15, 21-13 year after year, pitching lots of innings with exceptional strikeout to walk ratios, but tons of home runs allowed. Roberts had exceptional control (almost always finishing first or second in least walks allowed per inning) and did indeed lead the league in home runs allowed four straight years. It’s a combination that can win, particularly with some fleet outfielders. Roberts was such a flyball pitcher that Richie Ashburn aggregated six of the 10 highest putout totals ever for an outfielder. All of the pitchers in the Robin Roberts family had severe platoon differentials: lefties hit about 40 points higher than righties against both Jenkins and Hunter. In the second half of his career, lefties batted .294 against Roberts. 16. Carl Hubbell (199 WSAB/305 WS): Hubbell had that screwball; they say his arm was turned permanently outward as a result of throwing it all those years. They also say that Walter Johnson could scratch his knees without bending over. Who knows? Hubbell had exceptional control and the screwball seems to have helped him keep his batted balls fieldable. 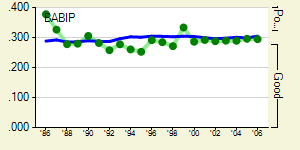 The graph shows his career BABIP, which was below average most of his career. 17. Randy Johnson (198 WSAB/311 WS): One of the all-time great strikeout pitchers, Johnson led the league in strikeouts nine times. At 10.8 strikeouts per nine innings, he has the highest strikeout rate in history. He is also death to lefty batters, who have hit only .196 against him. Most tellingly, Lefty batters have only stepped up to the plate 12% of the time against him. Carlton pitched to lefties 16% of the time; Glavine has faced lefties in 20% of his plate appearances. 18. Cy Young (197 WSAB/303 WS): This ranking is completely unfair to Cy Young. He first pitched in 1890, so his place here is based only on the second half of his career. He had such exceptional control that his profile looks like Robin Roberts’, except that no one hit home runs back then. I wonder if he was a flyball pitcher? 19. Jim Palmer (196 WSAB/312 WS): Palmer won three Cy Young awards and led the league twice in ERA, but he never came close to leading the league in strikeouts or giving up the least walks per nine innings. 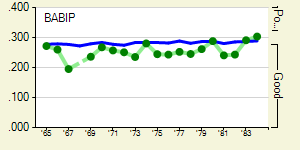 No, Jim Palmer was the master of the LOB (Left on Base) and BABIP (see the graph). With runners in scoring position, Palmer’s batting average allowed sank from .230 overall to .213. With two outs and runners in scoring position, it sank further to .207. Many great pitchers pitch better with men on base, but Palmer’s performance was better than most. And that BABIP? I think you can chalk up almost all of it to that wonderful Orioles defense; the team BABIP during the years Palmer pitched was around .260—only slightly higher than Palmer’s career mark of .255. 20. Dennis Eckersley (194 WSAB/301 WS): Eckersley is the first pitcher on this list who relieved for a significant amount of time. I spent a lot of time struggling with relievers in my WSAB methodology, and I’m still not sure it’s right. There are two issues: relievers get credit in the Win Shares system for pitching high-leverage innings, so good relievers naturally have more Win Shares per inning pitched. And it’s easier to relieve than it is to start. 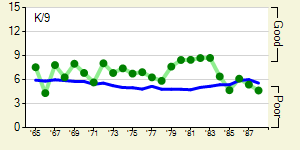 For example, look at what happened to Eckersley’s strikeout ratio when he was moved to the bullpen in 1987. It took off because he knew he was almost always only going to pitch for one inning. He could throw his best and not worry about saving himself. I’ll explain how I handled relievers at the end of the article but this ranking for Eckersley feels about right. 21. Red Ruffing (194 WSAB/322 WS): Ruffing was one of the first adopters of the slider. That, and the fact that he pitched for the Yankees during the ’30s, are probably the most significant things you can say about the guy. He only won one ERA title and one strikeout title. But he pitched well for a long time (twice among the top 10 youngest players and twice among the top 10 oldest) and deserves his place on this list and in the Hall. 22. Bert Blyleven (192 WSAB/339 WS): Bert Blyleven is the first pitcher on our list who is eligible for the Hall of Fame but not in it. In fact, he is the only one of the top 33 pitchers ranked by WSAB who isn’t in the Hall. Why is that? Well, he was a strikeout pitcher with great control, but he only led the league in strikeouts once. He never led the league in ERA, never finished higher than third in Cy Young voting (weird fact: in 1984, he finished third to two relievers: Willie Hernandez and Dan Quisenberry). This wasn’t just the result of sportswriters’ bias, by the way. He just didn’t have many remarkable peak seasons. Blyleven is 120th in All Star Win Shares; only three other pitchers we will consider today rank lower. On the other hand, all three of those pitchers are in the Hall of Fame: Eppa Rixey, Nolan Ryan and Don Sutton. Bert should be there too. 23. Ferguson Jenkins (190 WSAB/323 WS): See Robin Roberts. 24. Ted Lyons (189 WSAB/312 WS): Ted Lyons may be the worst strikeout pitcher on this list—he averaged only 2.3 strikeouts a game. He also wasn’t too shabby with the bat, hitting .311 in 1930. In 1942, when Lyons was 41 years old, he only pitched for the White Sox every Sunday. He completed every game, went 14-6 and led the league with a 2.10 ERA. As Bill James pointed out in the new Historical Abstract, that was back in the day when teams played doubleheaders every Sunday. Remember doubleheaders? 25. Eppa Rixey (183 WSAB/315 WS): Rixey pitched from 1912 to 1933, during Pete Alexander’s heyday, with the Phillies and Reds. When the Phillies sold Alexander in 1917, Rixey was so disgusted that he quit for a year and served in World War I. 26. Tom Glavine (180 WSAB/303 WS): Glavine is a master of guile. I’ve got to think that very few pitchers got to own a part of the (pseudo) strike zone the way that Glavine was given the outside part of the plate. Thanks to that curve on the outside “corner,” righthanded batters actually had a lower batting average against him than lefthanded batters. And he never gives in, always happy to walk a batter, even with runners in scoring position, just to maintain his ownership of that corner. 27. Bob Feller (179 WSAB/292 WS): What would Bob Feller’s career have looked like without World War II? 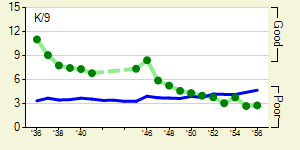 The graph on the left (strikeouts per nine innings) should give you an indication. He led the league in strikeouts every full season he played from 1938 to 1948. In his prime, he averaged about 20 WSAB per season. Add those four years back to his career total, and he’s got 219, good for 10th place. 28. Ed Walsh (179 WSAB/265 WS): Ed Walsh pitched from 1904 to 1917, and the further I go down this list the more I’m convinced you should adjust Win Shares by era to get a fair pitcher ranking. I don’t mean to knock Walsh, but he only had seven good seasons. Now, they were really, really good and he pitched a lot in those years (464 innings in 1908, for instance). His WSAB total is based on his real performance. But the conditions were such that no pitcher today could ever hope to match his best season. He accrued 34 WSAB in 1908; in Clemens’ best season he picked up 24 (1997). 29. Hal Newhouser (176 WSAB/264 WS): Hal Newhouser had one goofy career. A hard throwing lefty, Newhouser could strike out lots of batters but only reached success when he found the strike zone (see the graph) in 1944. Kept out of the war because of a congenital heart defect, Newhouser went 9-11, 8-14 and 8-17 for the Tigers before finally blossoming (at the young age of 23; he first pitched in the majors when he was 18). He was lights out from that point on, even winning the MVP in both ’44 and ’45. 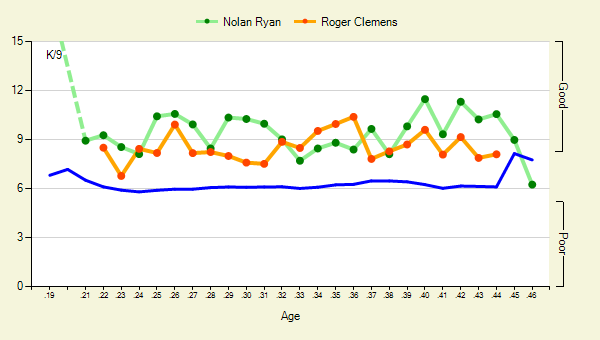 In a nutshell, Ryan led the race early, Clemens had a great surge in his mid-30’s, and Ryan seemed to find something extra when he hit 40. Speaking as someone on the other side of 40, I can’t even imagine that. 31. Early Wynn (175 WSAB/309 WS): Started pitching in 1939, but didn’t make his first All-Star team until 1955 a few years after Mel Harder convinced him to scrap the knuckleball and throw a curveball and change instead. 32. John Smoltz (172 WSAB/269 WS): Third member of the vaunted Braves’ rotation of the 1990s. Starter ERA = 3.36; Reliever ERA = 2.35. 33. Red Faber (172 WSAB/292 WS): It’s hard to say what made Red Farber so good. He might have been a Tom Glavine-type, pitching to the situation and deploying his spitter (one of the last legal ones) to induce fieldable balls. 34. Jack Quinn (170 WSAB/287 WS): Quinn was the oldest player in the AL five times and one of the 10 oldest 15 times. Incredibly, he is 76th in All Star Win Shares, and the first non-Hall of Famer on our list other than Blyleven. 35. Pedro Martinez (170 WSAB/248 WS): Pedro is 35th in WSAB but 10th in All Star Win Shares. In his prime, the best ever. 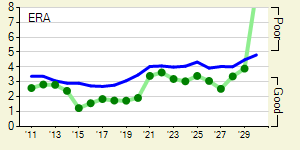 Check out some of his graphs in Fangraphs. 36. Whitey Ford (168 WSAB/261 WS): Ford was a great situational pitcher, as you can see by the number of men he left on base. Overall, batters hit .240 against him, but .226 with runners in scoring position and .215 with two outs and runners in scoring position (includes the years 1957-1967 only). 37. Carl Mays (168 WSAB/256 WS): Unfortunately known for killing Ray Chapman with a fastball, Mays was a sidearmer at a time when sidearmers were rare. 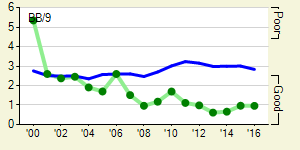 As a result, he typically had lower BABIP averages than the league in the first half of his career. 38. 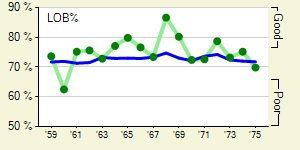 Hoyt Wilhelm (167 WSAB/256 WS): Wilhelm is the highest rated pitcher who was a reliever virtually all of his career. He also definitely had a big impact on his BABIP, as most knuckleballers do. The second-highest rated reliever is Goose Gossage, at 56. 39. Wilbur Cooper (164 WSAB/266 WS): Cooper was a fine pitcher, of course, but he’s on this list more because of when he pitched (1912 to 1926) than how well he pitched. 40. Don Sutton (164 WSAB/319 WS): Sutton is 235th in All Star Win Shares, he also benefited more from his ballpark than almost any other player on our list (2.66 ERA at Dodger Stadium; 3.63 everywhere else). That is all I will say about Sutton. And there you have it: our all-time Win Shares Above Bench survey. I’ve enjoyed this review and learned a lot in the process. Most particularly, I’ve learned that there are two glaring omissions from the Hall of Fame: Sherry Magee and Bert Blyleven. I know that the sportswriters can’t do anything about Magee, but here’s hoping they rectify the Blyleven omission soon. – First calculated the “expected” Win Shares for each pitcher, based on the number of innings he pitched and the average number of pitching Win Shares accrued per inning in that league that year. – Multiply expected Win Shares by 50% for starters and 75% for relievers to get a “bench level” of Win Shares. I use 50% for starters because I’m convinced total Win Shares undervalues starting pitchers. – Subtract one from the other to calculate Win Shares Above Bench. All Star Win Shares are the number of Win Shares above 125% of expected Win Shares, with no deduction for any totals below 125% of expected Win Shares. In other words, All Star Win Shares gives pitchers credit for extraordinary years, but no subtraction for subnormal years or injuries. For two good examples: Sandy Koufax is 31st in All Star Win Shares and Dizzy Dean is 30th. In WSAB, however, both are in the 90’s. For relievers, I used 250% of expected Win Shares. This may strike you as high, but relievers can pick up some huge numbers of Win Shares just based on their leveraged innings. Even using 250%, Mariano Rivera is 19th all-time. Billy Wagner is 41st. I used many sources for this article, including Bill James’ and Rob Neyer’s Guide to Pitchers and James’ two Historical Abstracts. After posting the article, one reader pointed out to me that Eddie Plank actually didn’t attend Gettysburg College. According to Wikipedia, History books often erroneously state that Plank was a graduate of Gettysburg College. Plank did attend the Gettysburg Academy, a prep school affiliated with the college, but Plank never attended nor graduated from the college. Plank did, however, play for the Gettysburg College baseball team. I get longevity is a big factor. Who do you want starting your 7th game. Don Sutton, Phil Niekro or Sandy Koufax? Yes, Lennie. That is exactly the ranting type of email I get about this subject. Great example of ignoring all the points I made in the other article. Thanks very much for the demonstration. yeah i agree with this guy Koufax is the Best…………..
You mention a Sherry Magee and that the sportswriters can’t do anything about his getting into the Hall of Fame. Can you tell us a little about him and why he can’t get in? Dave, the two greatest pitchers of all time are not even in your top ten. I won’t go into Koufax because that’s gotten plain boring, but Pedro is the one pitcher aside from Sir Walter himself who might be better than Koufax. And putting Clemens ahead of Pedro is childish. Also, Dave. Ever heard of Addie Joss? I suggest you look him up. Uh… Dave. One more thing: You also need to look up Dazzy Vance. He pitched in the 1920s. You’ve heard of Rogers Hornsby, I’m sure. Yeah, THAT Rogers Hornsby. The year he hit .424, the all-time record batting average, well, he didn’t win the MVP. Because Dazzy Vance did. You like stats, Dave. 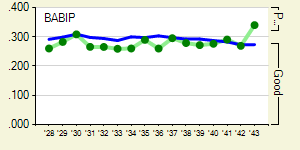 Look up Vance’s winning percentage relative to his team’s percentage through the ’20s and early ’30s. No mention of Sachal Page? …and what morphed the screwball and made Bob Gibson and many modern closers tactical… Sachel!